Bassist/composer/educator Jay Anderson (b. in California) is so much in demand that it is difficult to come up with any distinguished musicians who have not had Jay in their band for gigs and/or recordings. Here on his 92nd appearance on SteepleChase the label has the pleasure of showcasing Jay Anderson as the frontline soloist/leader. 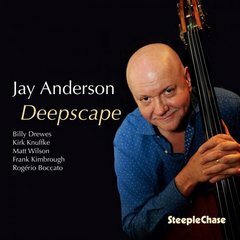 Anderson with dazzling ability to create musical landscape presents 11 tracks with diversity unified by the deep resonance of a double bass superior. Прекрасный альбом, особенно для утренней бодрости духа!